In 2016 and again in 2018 the Court of Justice of the European Union (CJEU) ruled that Western Sahara is not part of Morocco and Morocco has no jurisdiction or sovereignty over the non self governing territory of Western Sahara. The CJEU made it clear that the people of Western Sahara must be regarded as a ‘third party’ and can only be affected by the implementation of EU-Morocco agreements if they have consented. To circumvent the ruling of the CJEU the European Commission has proposed an amendment to the Association Agreement. Nothing in the Commission’s proposal suggests that the Commission has respected the CJEU judgment. Rather than seek the consent of the people of Western Sahara, the Commission has resorted to a “consultation process” of Moroccan elected officials and Moroccan economic operators. The Commission claims that 112 associations or institutions have taken part in their “consultations”, and that there is general support for the agreement. This is wrong. Of the 112 associations listed as being consulted, 94 have either never been invited by the Commission for such talks, or have specifically refused to meet, as such talks fail to meet the CJEU’s prerequisite of consent. Although we were never consulted WSC is included in the list. Instead of seeking consent from the people of Western Sahara (as the CJEU demands) – the Commission it has been in ‘consultation’ with the ‘population’. Today that population consists of a majority of Moroccan settlers, and leaves out the majority of the Saharawi people that have fled their homeland either during the war or as a consequence of the dire human rights situation under Moroccan occupation. The CJEU never mentions the population of Western Sahara. On 16 July the European Council voted in favour of the amendment. It now needs the approval of the European Parliament. Write to your MEPs urging them to oppose the amendment when it comes to the European Parliament. Find your MEP here Remember all the MEPs in your region represent you so you can e-mail or write to them all. •	The Commission has not sought the consent of the Saharawi people. •	Although the Commission acknowledges that it does not recognize Morocco’s sovereignty over Western Sahara it has made no effort to seek the consent of the people of Western Sahara or to include them in the negotiation process. •	The Commission argues that the agreement will benefit the local population. This is irrelevant; the CJEU ruled that the Saharawi people need to consent. •	Instead after the proposed amendment was initialed with Morocco on 31 January 2018 the Commission engaged in “consultation”. •	The WSC did not engage in consultation but it is listed by the Commission as having been consulted. •	The Agreement will only benefit the Moroccan and European economic operators and the Moroccan settler population; it will not benefit the Saharawi population most of which is exiled in refugee camps. •	The Agreement reinforces Morocco's illegal annexation and undermines UN-led peace efforts. 93 Saharawi groups have called on the EU institutions to respect the will of the people of Western Sahara when negotiating trade or fisheries agreements that will affect their occupied land. “We call upon the EU member states and the EU Parliament to reject any proposed agreement covering Western Sahara that does not have the explicit consent of the POLISARIO Front, as the legitimate representative – and recognized by the UN as such - of the people of Western Sahara", the text reads. 11 June 2018, the EU Commission sent a proposed amendment to the EU-Morocco Trade Protocols to the EU Member States and the EU Parliament for approval. 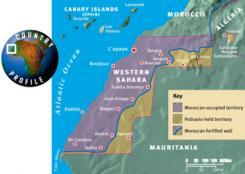 The proposal seeks to extend the scope of the trade deal into occupied Western Sahara. Western Sahara Resource Watch has written a short brief outlining the most problematic points of the Commission's approach. 84 million in return for fishing licenses - is what Rabat threw on the table in the EU-Morocco negotiations for a new Fisheries Protocol. According to Moroccan Media, the Moroccan government is upping the ante in the current negotiations between Rabat and Brussels to reach a new Fisheries Protocol. Morocco now demands 800 million Moroccan Dirham - or €84 million - in exchange for fishing licences for EU vessels. Under the current protocol, which expired last Saturday, Morocco receives around €40 million annually. On 15 June 2018, the Western Sahara liberation movement Polisario announced that a new case has been launched regarding the EU-Morocco plans to cooperate on fisheries in the waters of occupied Western Sahara. The creation of a state of siege, a wave of arrests, police violence, demonstrations and a media blockade. The UN Special Envoy Horst Khöler recently visited Western Sahara in order to gain a deeper understanding of the conflict. The Special envoy, after having visited the Saharawi Refugee camps in Tindouf, Algeria, arrived in the capital of Western Sahara, Layounee, on 28 June 2018. He toured the non self governing territory until Sunday, 1 July 2018. Prior to the visit of the UN Special Envoy the Kingdom of Morocco systematically intensified the grip of repression in the occupied territory with the transportation of thousands of police officers, auxiliary and gendarmerie forces to Western Sahara and the arrest of more than 50 Saharawi. Adala UK witnessed growing repression on the Saharawi civil society and increasing use of police violence towards demonstrators. The decision, adopted unanimously by the leaders of the African Union (AU), on the creation of an African mechanism for the issue of Western Sahara is an “anticipatory initiative” likely to revitalize the AU’s key role, as a fully-committed partner for the United Nations (UN), and an “important step” considering the Moroccan position aimed at undermining the African efforts for the settlement of the conflict in Western Sahara, said Thursday the Polisario Front in a letter sent to the United Nations and the Security Council. A new book has been published describing the political aspects of the plunder of the natural resources of occupied Western Sahara. The book looks at how commercial interests undermine self-determination in the last colony in Africa. It explores the political arguments that the European Commission used to defend the illegal EU fisheries agreement in the waters offshore Western Sahara back in 2011. It also studies the arrest of the NM Cherry Blossom bulk vessel in South Africa in 2017, containing phosphate rock from the territory.